More NASA - the space agency has been crowd-sourcing ideas for asteroid missions. A massive storm on Saturn pulled water- and ammonia-ice from the gas giant's depths. 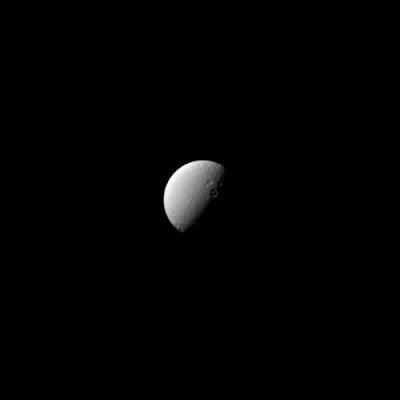 Imaged by the Cassini spacecraft, the terminator of Saturn's moon Dione passes through Dido crater, with its central peak. Just above it, in sunlight, on the sub-Saturnian hemisphere of the little moon, are the twin craters Romulus and Remus (Romulus is the larger one). In The Quiet War, the city of Paris, Dione, runs down into Romulus crater on the slope of the rimwall shared with Remus crater. Richard B. Riddick, the shaven-headed silver-eyed antihero of Pitch Black and its sequels, is an exemplar of that hoary old SF trope - the competent man. Played by Vin Diesel, he's the last of a warrior race: brutal and uncompromising, with eyes modified so that he can see in the dark, he dominates every situation he finds himself in, is able to out-think every enemy. After a space-operatic sequel, The Chronicles of Riddick and an animated film, The Chronicles of Riddick: Dark Fury, failed to build on the first film's success, it seemed that the franchise was over. But neither Vin Diesel nor writer/director David Twohy were prepared to let it go: Riddick, as its name suggests, is a back-to-basics reboot. Riddick has become the unwilling leader of the Necromonger cult. Betrayed into thinking that his home planet, Furya, has been rediscovered, he's abandoned on a deathworld, and attracts the attention of two groups of mercenary bounty-hunters - one simply out for the reward money, the other led by a man with a personal agenda - in an attempt to effect his escape. It's a simple but effective three-act story in which Riddick and the franchise rediscover their mojo. In the first part, Riddick makes like a barbarian version of Robinson Crusoe on Mars, battling alien predators and setting up camp; in the second, the viewpoint shifts the mercenaries as Riddick picks them off one by one; in the third, as in Pitch Black, the surviving players have to deal with a horde of monsters. The tension occasionally slackens as the mercenaries squabble and wander about the landscape; the lone significant female character (Katee Sackhoff), despite her demonstrable toughness, is defined by male attention (and given an unnecessary shower scene); oblique references to previous films may confuse those who haven't seen them. But there's plenty of good hard-edged dialogue, and Vin Diesel completely inhabits his anti-hero, setting his intricate plan for escape in motion, ghosting in and out of darkness and rain, and calmly pulling off a startling execution while chained up. It's all good, old-fashioned B-movie fun, punched up with gory effects. And while it doesn't give any new insights or character development to its anti-hero, it's a shot in the arm for the franchise and a refreshing change from this summer's depressing parade of bloated blockbusters.